Change is necessary, change is good, but sometimes change brings sadness. As part of my family history research I’ve come across a lot of churches that are no longer standing and graveyards that have long since been lost in the mists of time and buried under decades or centuries of change. Sometimes they’re flattened by war, sometimes they’re demolished simply because they’re in the way. I just came across St Mary’s Church in Birmingham whose churchyard was the last resting place of my great x 5 grandmother, Mary Moseley. She died in March 1833. 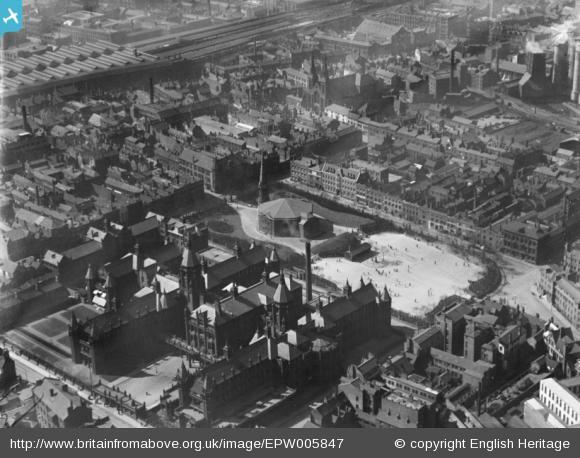 St Mary’s Church and General Hospital off Whittall Street, Birmingham, 1921. The same scene today – now Birmingham Children’s Hospital. Source: Google Earth. Looking at the two images above you can see that the old hospital with its two towers (slightly distorted by the Google Earth’s rendering) is still standing but the unusual octagonal church and surrounding gardens that lay beyond it are no longer there. St Mary’s is long gone. 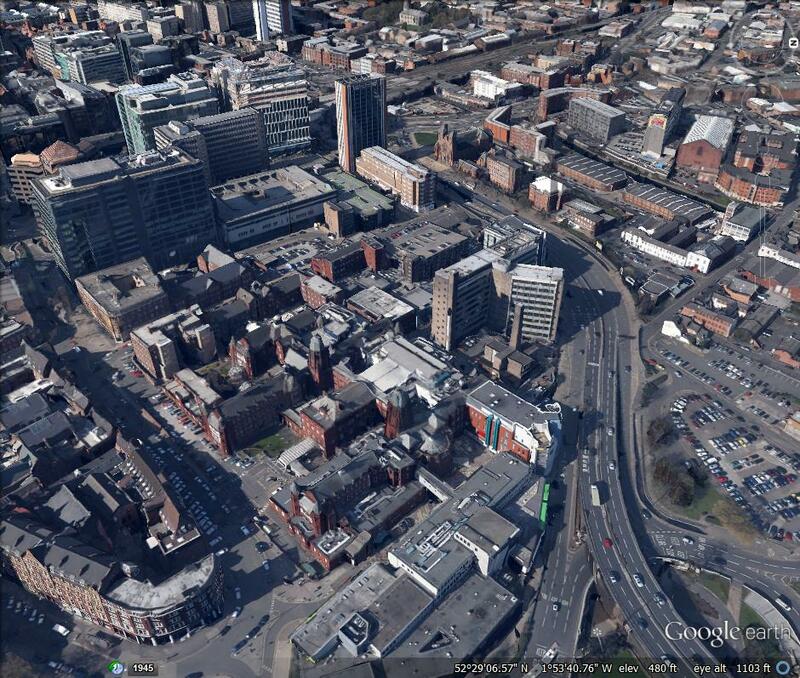 At the beginning of the 18th century Birmingham began to spread northwards from its ancient centre around the Bull Ring. One of the earliest estates to be laid out was that of Dorothy and Mary Weaman. However, housing development here was slow, and so the ladies decided to build a church, not so much to cater for local residents, but rather to attract new residents. At a time when most pews were rented and the best pews had been taken in the other churches in the town, this would prove an attractive proposition to newcomers to the estate. They would live close to their place of worship and, if they subscribed towards the building of the church, they would be guaranteed the rent of a prestigious pew near the pulpit. St Mary’s was built in 1774 in Whittall Street by Joseph Pickford, an architect from Derby who had worked on the Palladian Horse Guards building in Whitehall. A chapel of ease of St Martin’s, St Mary’s took its dedication from the Christian name of Mary Weaman, for, although the cost of building was raised by subscription, Mary Weaman gave the site for the new church and £1000 towards its construction, by far the largest single amount. The final cost was around £4700. When first built, the church stood in open ground on the north edge of the town, but the creation of a new church here had the desired effect and the area was soon built up around it. St Mary’s was an octagonal brick building with a small tower and spire, in a neo-classical style and surrounded by a large churchyard. The importance of being assured a place of burial was probably of equal rank to that of having a guaranteed seat in the church. The octagonal shape of the church was considered ideal for preaching and there was only a small apsidal chancel. There was a tower of three stages, the first round, the second octagonal with Doric columns at each angle, and the third octagonal with a clock face and pediment on each alternate side. There was a slender spire. In 1776 part of the gallery collapsed during the morning service. Although there were no injuries other than the loss of some ladies their handkerchiefs and some gentlemen their hats, this was a serious matter. The trustees had difficulties in arranging a meeting with the architect. In the end the matter was settled by Pickford’s offer of £400 in settlement. One of the Hiorne brothers (it is not known which one), the architects of St Bartholomew’s in Masshouse Lane, was consulted. He suggested using cast-iron columns to support the gallery. If this is not the first example of the use of cast-iron this way, it is certainly one of the earliest. St Mary’s had a Methodist connection (Methodists were part of the Church of England until after John Wesley’s death in 1791). In 1786 John Wesley attended a service at the church to hear ‘an admirable sermon’ from the curate. The church remained a focus of evangelical preaching until the end of the 19th century. Around the beginning of the 19th century the district became a focus for gun manufacture. The rear gardens of the large Georgian houses were first used to carry out manufacturing processes, and then the houses themselves were used. And the area quickly lost its high-class status. In 1841 St Mary’s was assigned a parish out of that of St Martin’s. In 1857 the building was renovated. The tower and spire were found to be unsafe and were rebuilt in 1866 to a very similar design, but with pilasters instead of columns and a balustrade on the second stage. In 1888 400 of the 1700 sittings were free. At some point the tower and spire appear to have been rebuilt yet again. In 1882 the churchyard, presumably now full, was taken over by the Corporation and laid out as a public garden, known as St Mary’s Garden. In 1897 the General Hospital was rebuilt in Steelhouse Lane close to the church. Because of need for land for the expansion of the General Hospital, St Mary’s was closed in 1925 pending demolition and the parish united with that of the Bishop Ryder Memorial Church in Gem Street. St Mary’s Church. Image from R K Dent, 1878, ‘Birmingham Old & New’. I know the burials were reinterred elsewhere before the building work began, some in Witton Cemetery around 1927, and the rest in Warstone Lane Cemetery around 1952-53. In 1882 a record was made of all the monumental inscriptions in St Mary’s churchyard but sadly there were no Moseleys listed. This could be because no stone was ever placed on the grave or because the one that was had succumbed to the ravages of time. This, of course, means that Mary’s new grave wherever she was reinterred will also be unmarked. Fascinating, and very interesting pictures. Do you know how your ancestor came to be in that area? was she one of the new settlers attracted by the new church or did she live there at a later time, after the church had been built for some time? It’s amazing you are able to go so far back, I myself can only reach as far as the early 1900s, which is when my great-grandmother was born. I honestly don’t know why she was buried in that particular church. She didn’t live that close to it and her children appear to have been baptised elsewhere. Anymore information may remain elusive, I don’t know Mary’s maiden name and Moseley is a common surname in the area. Being able to trace my family has been entirely dependent on the release of more and more records online. Parish registers are becoming more available to the armchair genealogist which helps enormously and some strands of my research go way back into medieval times thanks to me having some distant connections to the nobility – the Moseleys are just ordinary working class folks which potentially makes them more difficult to research. Where are you from? No worries. I love talking to my family about the family history. Always new stuff to learn! I am originally from Russia. There is nothing at all available as far as digital information is concerned unless a relative is a veteran of the WWII, and I don’t have any of those as far as anyone knows. One would have to locate and visit any surviving archives in person. Honestly, I don’t really see that happening, just for the sheer amount of resources, financial and otherwise, it would take. Thankfully both my grandmothers are still with us and I can make sure that anything they still remember is recorded. I long to know more though, and it is sad that some things just cannot be recovered. Ah…I understand. We are very spoilt in the UK. Maybe it might be possible to talk to other Russian researchers in forums who can and do visit the archives and who might be willing to assist you. You might find they’re looking for the same information. I’ve found distant relatives through doing that kind of thing specifically in Canada where I found they had records in their archives relating to the family that stayed behind in the UK. I appreciate that Russia is a whole different thing though. I wish you much luck. I know what you mean. I guess part of me wants the chance to walk where my ancestors walked, visit their churches, pay my respects, see where they lived, etc., but I can do that in other ways. I’m so lucky that I know who almost everyone is in all the hundreds of photos I have, or I’ve been able to identify them through research. As I also have no children I have started to think about what I want to happen to all my research once I’m gone – identifying people on both sides of family that I might pass it on to. I always assumed I’d get to teach my own offspring about their roots but it seems unlikely now. Kathryn, all the grandchildren over here are fascinated with your genealogical research of our family, as am I. We’re very grateful for everything that you’ve shared with us. Your writing is just wonderful. Ah thank you! I’m just glad my research put us in touch. I love having relatives “over the pond”! This was a really interesting article kathryn – thank you. Between 1616 and 1900 all the relatives in one strand of my family were buried in Odell churchyard, Bedfordshire. I found them courtesy of the parish records, which have been digitalised. However, there are no grave stones – probably because they were lace makers and agricultural labourers and couldn’t afford it. I’ve looked at Odell on google maps and it looks very quaint. I know what you mean about wanting to walk in their footsteps – i long to go and see Odell myself. It seems to have plenty of very old houses still standing that i think my ancestors would recognise. I don’t agree that these people have been forgotten. I’ve looked at dates of birth, marriage and death and all the other clues that come with those (like how many children they had/ their professions/ how they died) and really wondered what they were like. Like my great great grandmother, who had 8 children (one out of wedlock – father never named), two husbands and described herself on the census as a washer woman. Or the couple who married in the debtors prison in St Sepulchre, London (now part of Smithfield meat market) – she married twice in 5 months and i can’t find a death certificate for the first husband so was she a bigamist? Not just direct relatives either – so the childless have certainly not been insignificant to my search. Their blood runs through my veins and it really made me sit up and be thankful for the era i was born in and the choices i had. I think they were probably there before 1616 but I haven’t found the records yet. It did make researching that bit of the family easy, I have to say! It also made me realise why my father joining the RAF and spending most of his life overseas was so difficult for his parents ( grandpa had left Odell for his wife’s village in nearby Northamptonshire). Like you, I also enjoy seeing history from my ancestors perspective. For example, I was listening to the Melvyn Bragg series about history- the death of Elizabeth I. The historian was talking about James I ‘s procession fromScotland to London down the road that has become the A1. And I thought that the A1 goes fairly close to Odell so maybe my family saw that. One day the missing link will fall into your lap and you will know why Mary was buried in that church – I guess that is what keeps us going. You haven’t forgotten your relatives, and that’s great. It would be silly of me to think, however, that anyone will remember me in another century, and I think my experience is more common than not — the historical record tends to demonstrate that the vast majority of all people who have lived throughout history have been forgotten by those living in the present and will continue to be. (Sorry — but not everyone is all that interested in family history. Even if I look at the people in my family who have been, and who have produced genealogies, once those people are gone, the interest will be gone and the people will be forgotten — and it’s only honest to admit that all we “remember” about most of those people is when we filled out a form to put their important life dates on them.) At some point the dead have to make space for the living. I don’t think that we have to get wild knocking down cemeteries; I think the natural processes that occur are fine. But I really appreciate the German custom in many places of renting spaces in cemeteries. At the point at which no family member wishes or is capable of renting the space, it’s cleared out for someone else’s remains. I completely understand what you’re saying and I admit I tend to get lost in my passion for discovering my ancestors. I am lucky that many people in my family are interested in what I’ve discovered but I know that not all of them will be and that’s something I have to learn to accept. I try to visit graves when and where I can because I personally hate to think that people are forgotten but of course the rational side of my brain knows that of course they are and that I probably will be too. I was thinking specifically of this cemetery that’s about a third of a mile from where I grew up — it’s called “Pioneer Cemetery” and it’s on land that accrued originally to the township when its boundaries were drawn in 1848 (when WI became a state). It’s tiny, there are about 25 graves there, and no one in town now knows who those people are, really. The oldest families in the community now moved there sometime in the 1870s with the railroad. Those later people are all buried in the church cemeteries of their respective churches, or in the big cemetery in town. It turns out that archaeological excavations show that there might have been a small settlement of Europeans under what became the golf course around 1980 or so, where the township meets the current boundary of the city, about three miles away from the cemetery, and maybe those graves belong to the people from the disappeared settlement, but no one really knows — and it’s not like you couldn’t find out, I suppose, but it’s not immediately clear how. They’re not in any census record the township is aware of. The county historical society doesn’t know who they are. They’re just there. Maybe waiting for some Mormon to discover he’s related and baptize them or something? It’s not like they’re being treated badly. When I was a kid we used to bike over there and have picnics from time to time. Probably preteens make out there before they get their driver’s licenses. The township mows the cemetery and keeps the stones from falling over. No one’s disrespectful, mostly because it’s not that kind of place. But no one remembers those people, either. It’s part of the community life that they happen to be there. But if there’s some compelling reason to reinter them at some point? I can’t imagine who’d even be there to object. That’s rather fascinating really although I know that’s not the point you were making. Before i started on my genealogy, i also thought it would just be a dry list of names and dates. I started by spontaneously googling my father’s name and the first thing that popped up was actually him – it was his graduation from flight school. It got me wondering who went to see that – his parents or a girlfriend – and hoping they were proud of him. My father had been expelled from grammar school and sent down to the army recruitment centre by his irate father, so as an act of rebellion he went into the RAF centre instead and joined them. I know my own personality has been shaped by coming from a RAF family – so that friction between father and son has made me what i am today. It made me want to dig deeper and to look at the way my ancestors lived to help me gain insight into who i am. I hear the story of the Pioneer cemetery and see those people as so important to the community, even though no one knows their names. They built the town and so i venture to suggest they have been influential in the lives of all subsequent residents. I think maybe turning the cemetery into a memorial park that residents can use and enjoy might be the most appropriate way to honour them, now there is no one left to mourn. Well, my point is kind of that they *didn’t* build the community, as far anyone can tell or the historical record reveals. Near as anyone can guess, they were possibly people who came and lived there for a generation in the first old growth logoff (the first new growth trees after the “Big Woods” was logged off in our area date from shortly after the railroad), and some of them died while they were there and the rest moved away. The community as it understands itself started when the railroad came; the older settlement has been invisible since at least the beginning of the 1900s when the first pictures of the area survive. There are a number of church cemeteries that are older than that, of course, and those people are understood as linked in, so these were people who were there preceding a church, which also suggests practically no meaningful community life. In contrast, the people who built the community have small memorials; people know who they were; they show up in the accounts at the county historical society. And again, I’m probably one of about twenty people in the township who know even this much (and I haven’t lived there for years and wouldn’t count myself part of the community any more). So I would say, if the community doesn’t know they existed and can’t trace its relationship to them, they didn’t do much to shape the community. I’m sure being a professional historian makes my perspective unintelligible to most people, but the past isn’t really valuable on its own terms. History doesn’t exist, independently of us, or make itself — we are the people who make the past. So pieces of the past that survive here and there are only valuable when people choose to make meaning out of it. Genealogy is one way of doing that, and probably more people should be involved in it (I personally don’t find genealogy all that meaningful in my own life beyond the people I’ve known and the people who influenced them, but I have cousins who think it is and spend a lot of time on it, although most of what they do involves their imagination as actual sources that relate to the people whose names they are cataloging do not survive.) If you make meaning from your ancestry, that’s super — go for it. I would never question that process, which is typical of our immigrant, globalized age in which people have to explain things about their lives that stand at the end of a long chain of dislocations. I just don’t believe that society is obligated to keep all the pieces of the past hanging around forever on the behalf of genealogists or people who might want to visit a grave someday. I don’t feel society is obliged to destroy that past, either — as it disintegrates, and need for new, more important things is found and mobilized, the past goes away. As it should. I misunderstood- I thought those people had founded the community which had remained small until the railroad came through – but if you are saying they had gone before the railroad it does put a different spin on it. In the UK where we cannot help but be influenced by the past – everything is built on what came before. And then here in Australia we are encouraged to remember those who came before us and were swept aside In what amounted to a genocide. We honour the original people in every public ceremony to salve our conscious’ for their dispossession. So you can see why I jumped to the conclusion that the first settlers must be crucial. The descendants of the people we (mostly) genocided in the US are still around, too. They were mostly gone from the township where I grew up by 1848, but they didn’t go for away. There’s a reservation not that far from where I grew up, and they have their own relationship to the places they honor. None of them are in this cemetery, judging from the names. But I’d never venture to speak for them, anyway, which would be presumptuous — they can and should speak for themselves, if indeed, they wish to speak. Thanks for this article and for the excellent before/after images that you’ve posted. I came across an 1888 survey of the Gun Qtr this afternoon at the New Library of Birmingham and was struck by the unusual octagonal layout of St.Mary’s and its spacious churchyard, all long since disappeared. I can’t think of any other church building resembling it in Brum, before or since; a remnant of what must’ve been an elegant residential district of town. A good many such architectural gems have fallen foul of the continuing development in the City Centre (or bombing, or general neglect, perhaps) – the nearby St. Bartholomew’s, Christ Church and Church of The Redeemer all spring to mind, but few images remain to remind us of what was. Thanks for commenting. When researching my family tree I always try and see if my ancestors’ original final resting places still exist. So many have gone forever. I also like to search out where they lived, again, so few places still remain as they would have been. I thought St Mary’s was most unusual and, as you say, elegant!